Setup and ready to go on your site! 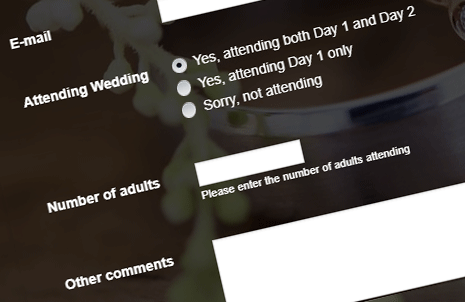 When your OurBigDayInfo Wedding Site goes live, we include an RSVP form on your wedding site which is setup and ready for your guests to use. This means you don't have to spend any time setting things up - we know you have plenty of other tasks to do! With our Premium plan, you can also add and remove options on the RSVP form and customize however you wish. You can ask your guests anything you wish to know to help your wedding day run smoothly. Our Team at OurBigDayInfo works closely with all couples to ensure that their RSVP form gathers the info they wish to know! No guests will get lost on your big day! With so many guests from so many places coming to your wedding, not everyone will be familiar with your chosen location for your ceremony and reception. Including maps and directions on your wedding website provides convenience to your guests and helps them plan their travel. Having Google Maps for your ceremony and reception location is the perfect way to ensure that not one guest gets lost on your big day! 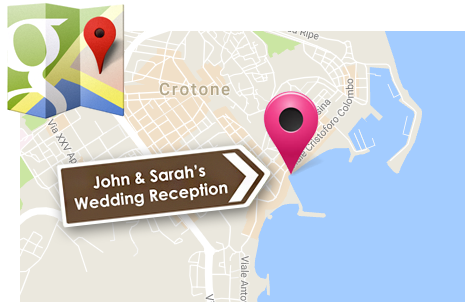 And to make things easy, adding a Google Map to your wedding website is one simple click - 'ON' - it's that simple! Ensure your reception meal runs smooth by giving your venue notice on which meals your guests would like at your meal. You can collect your guest's meal choice directly from your RSVP form! You've probably heard of wedding hashtags by now. However, we've taken it one step further - wouldn't it be great if any photos taken and hashtagged by your guests automatically appear on your wedding website? - well now you can! With a wedding website from OurBigDayInfo you can use our amazing new Instagram Feature, and see your big day through your guests eyes! 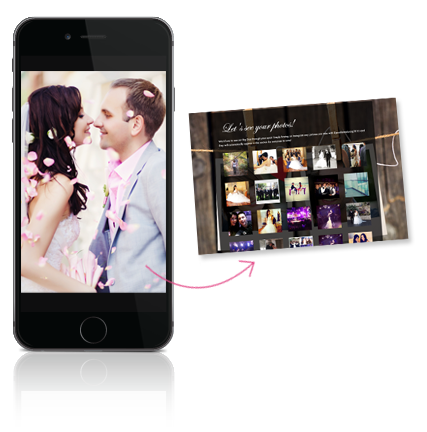 As guests take photos on their smartphone, they simply tag it with a hashtag specified by you on your wedding site, for example #jenniferandcraig2018. These photos then appear instantly on your wedding website within a beautiful gallery for everyone to view - clever isn't it! Save Money On Paper Invitations! 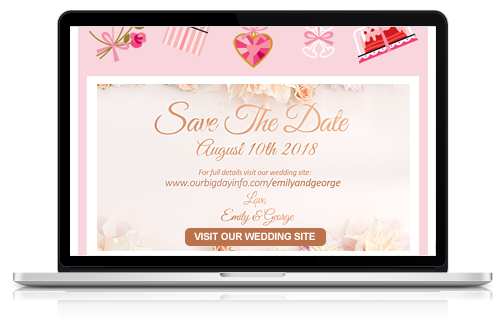 Embracing the digital world by creating a wedding website is one thing, but you can take this to the next stage by sending your guests your eCard invite (automatically created for all premium sites). Choose between a 'Save The Date' or a 'You're Invited' eCard! 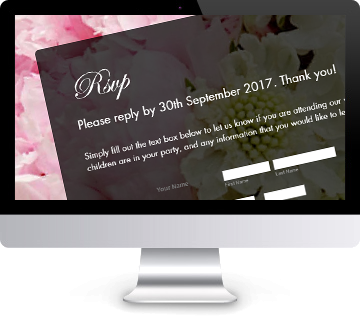 Sending your eCard invite electronically informs guests about your wedding date, location and of course your website address. 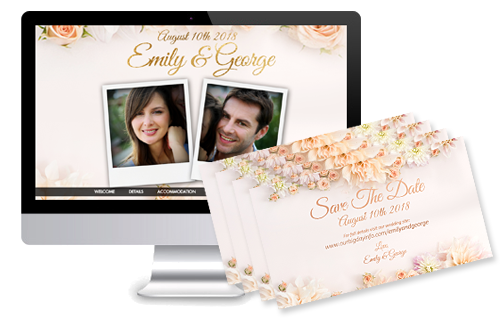 Digital invitations are becoming more and more popular with couples as they save on the costs associated with traditional paper invites. Using our portal you can create a guest email list and evite your guests using your eCard in one simple click. Our eCard invites are also printer-friendly should you choose to print using a high-street commercial printer or photobooth. There are no limits on how you choose to send your eCard invite. Some couples have even used WhatsApp and Messenger! Read More On Our Matching Wedding Invites! Give Late Guest's The Nudge They Need! Every couple planning their big day will experience some guests who are late sending their RSVP. 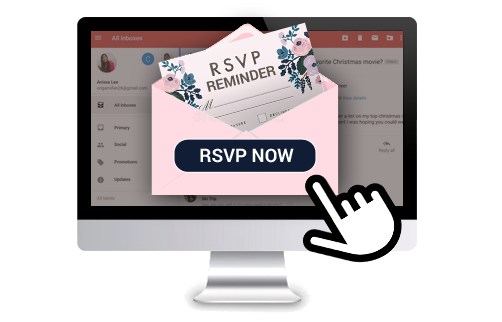 With our RSVP Reminder feature you can ensure you receive all your RSVPs in a timely manner by sending your guests a subtle reminder that they need to RSVP on your wedding site. Our RSVP Reminder feature comes as part of our eCard Invite feature. Send Your OurBigDayInfo eCard To Everyone! OurBigDayInfo eCard to everyone in one click! You can even preview the invite they will recieve so you can see what your guest's will recieve. Know exactly who is attending! 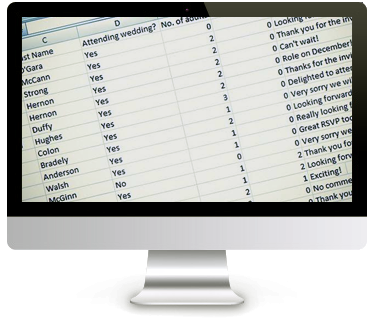 With our RSVP Reports, you will know exactly who is (and who isn't) attending your big day. 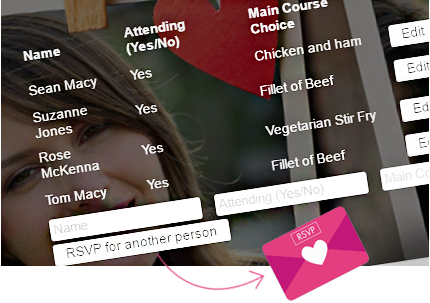 With the RSVP Report, you can search for your guests by name to see if they are attending, what their meal preferences are and lots more! FREE .com Domains With All Basic Plans! Included in all Premium plans, a personal .com domain is the icing on the cake for your wedding website. A personal .com address looks super neat on your wedding or save the dates invites, and makes your site address very easy for your guests (and you) to remember. They are also very unique and personal to you as a couple! How does it work? 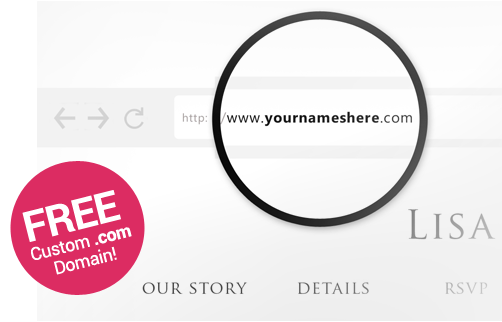 If your names are Laura and Ronan for example, your personal domain could be www.lauraandronan.com - we are now delighted to offer couples who chose the 'Plus' plan for their wedding website, a FREE .com domain if your wedding date falls within 1 year of your site creation. Read how to claim your FREE .com on our Offers page. Some weddings are made up of multiple events, and you may wish to ask your guests which parts they are attending. Events (aside from the actual wedding) may include a rehersal dinner, a BBQ the next day, or asking guests if they are attending day 1 or both day 2 and day 1. All this really depends on you the couple and how you plan your wedding. We work with our couples to help them decide how best to break down their events and word it on their online RSVP. Chat with us using our 'Live Chat' button on this page if you have any questions on RSVP muli-events for your wedding. Track the days, hours and minutes to your big day! Build excitement and remind guests how quickly your wedding is approaching by using our countdown timer feature on your wedding website. 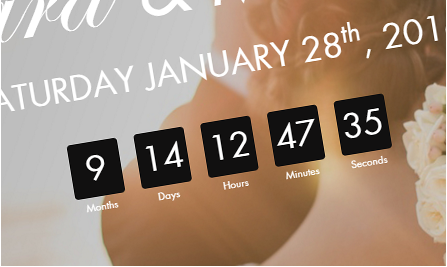 A countdown timer with the date and time of your big day, comes with your wedding websites as standard. You also have the option to turn this feature off if you wish. 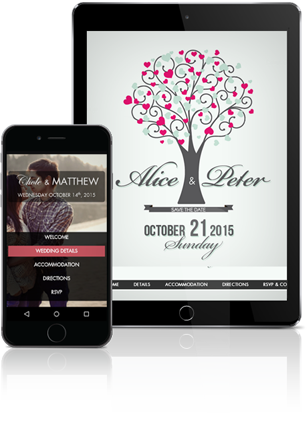 Your wedding website will be mobile and tablet friendly - meaning that your guests will be able to view your beautiful wedding site on their computer, tablet, or mobile phone. This is super helpful for wedding guests who are travelling to your reception or venue, and just need to find out from your 'Directions' section how to get there via their mobile on the big day itself!